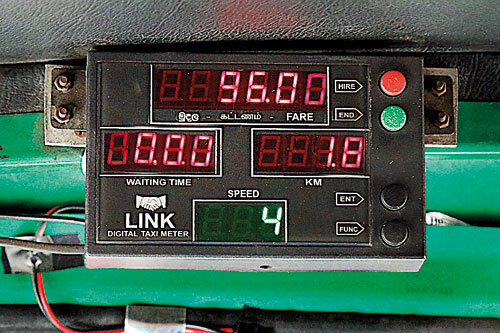 Despite forcing the government to extend continual leniency over the deadline to install fare meters in their vehicles, three-wheeler associations are refusing to obey the latest order, offering a litany of complaints and excuses. They vow to hold protests if the government goes ahead with plans to implement the fare meter regulation by August 1. “Making meters mandatory for three-wheelers has been a concept that has been postponed for months and I have a strong feeling that the meter regulation will not be implemented even on August 1,” All-Island Three-Wheeler Drivers Union President Lalith Dharmasekara said. He claimed the implementation date had been constantly postponed for political reasons. The issuing of fare receipts is one area of objection by the trishaw unions. Mr. Dharmasekara said drivers were not against giving receipts but opposed the measure due to the cost of issuing receipts. “The Gazette has not specified the issue of a printed receipt: it only mentions that a receipt must be issued to the passengers,” he added. The head of the Lanka Self-Employed Professionals’ National Three-Wheeler Federation, Sunil Jayawardana, said the regulations required the receipts to show the date, distance travelled, vehicle registration number and amount charged and it was impractical to issue a hand-written receipt with all these details when a trishaw was on a busy road, so the receipts had to be issued electronically from the meter. “I have been in this profession for 18 years and only about 10 or 12 passengers have requested receipts,” National Joint Three-Wheeler Drivers and Industrial Workers Association Secretary Rohana Perera said. The trishaw unions want the meter rule to be applied across all nine provinces and say a price formula must be introduced based on the geographical features of each province. Mr. Perera said that it was impractical and difficult to implement the fare meter regulation simultaneously across the whole island. “The concept that is already embraced by people in the Colombo district must gradually spread to the rest of the Western Province, and once it has been accepted by those people then the authorities must introduce it to other provinces,” he said. Both Mr. Jayaruk and Mr. Jayawardana said the meters currently on the market could be tampered with and their seals could be broken. They want the government to introduce a uniform, good-quality meter that would be used across the industry and would be impervious to interference by drivers. Mr. Jayaruk said his association was not ready to agree to the August 1 deadline and Mr. Jayawardana took the same stand, saying: “If the officials implement the Gazette on August 1, we as an association will go to court against the implementation of non-standardised meters”. Safety regulations governing three-wheeler operation – of which installation of an electronic meter is one measure – were gazetted and ready for implementation on January 9 last year but due to objections from three-wheeler associations were revised and had their implementation postponed on multiple occasions. This year alone, the implementation date was changed from April 20 to June 20 and then to August 1 to allow time for outstation drivers to obtain meters. Deputy Minister of Transport and Civil Aviation Ashok Abeysinghe has ruled out further extensions of the deadline. Officials from the National Council for Road Safety were unavailable for comment on the responses of the three-wheeler unions.